What if your fridge knew your food and expiration dates? 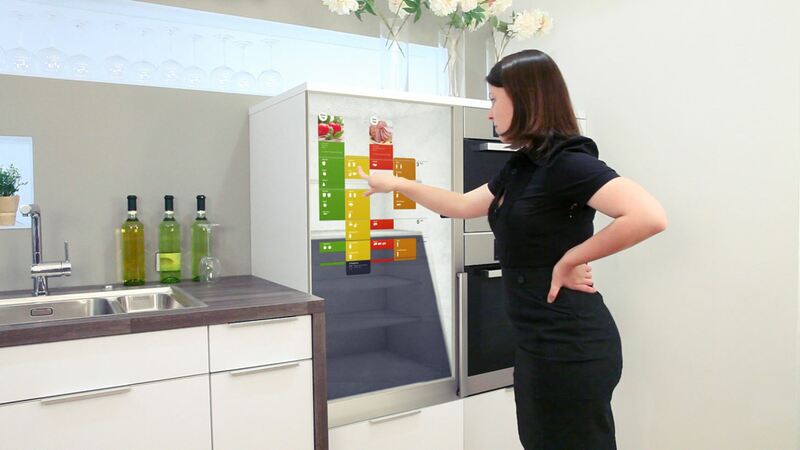 What if your fridge could tell you which ingredients are missing and where you can get them the cheapest? 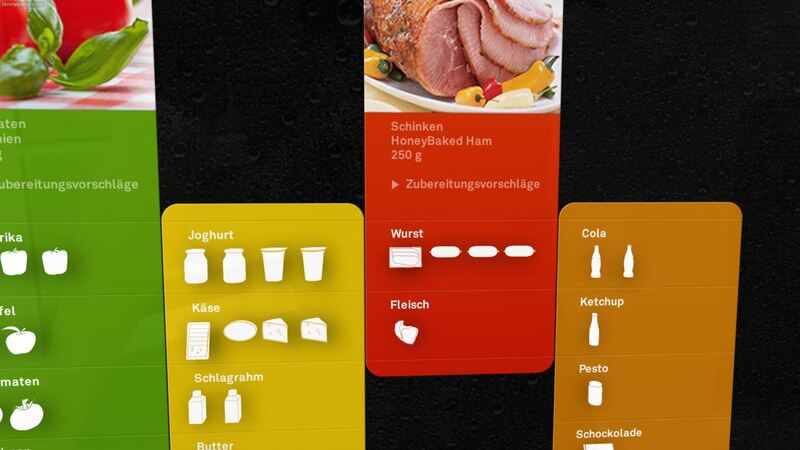 "In My Fridge" is a project designed to simplify the process of food management. Our focus was on the technical and the communicative aspect. The central technical item within the concept is the printable RFID tag. The RFID (Radio-Frequency Identification) technology is well known and has approved itself in the field of data acquisition. A new technique will soon allow to print these data storage units. On the one hand, this will decrease the production costs and on the other hand widen the range of use. We assume that supermarkets and stores will adopt these printable RFID tags in order to be able to determine their stock simply and briefly. And as goods don't have to be scanned anymore, the queue time at the checkout counter will be reduced. To acquire the data from the RFID tags, the household equipment simply needs to be equipped with an RFID reader. 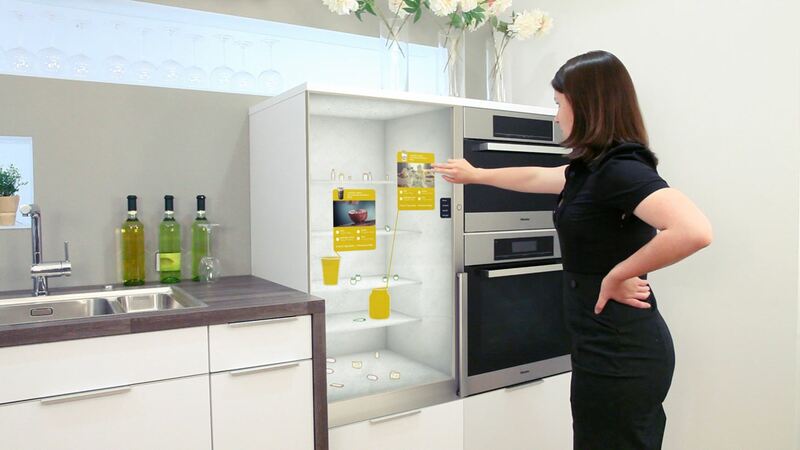 We integrated this futuristic scenario into our concept and equipped the refrigerator with RFID readers. Therefore we are able to collect all types of information of various products now. The storage place for perishable goods - the refrigerator - plays a key role in the process of food management. It collects all data and provides the information with the help of a touch display. Besides basic information like quality, quantity, date of expire or ingredients, additional information like recipes or diet plans are available due to the connection between the different storage rooms. Furthermore, the refrigerator would warn you about food allergies, if you picked up something inappropriate to eat. The connection between our system and local supermarkets allows you to check their storage state or prices, and even lets you create a digital shopping list. In conclusion the printable RFID technology widens the use range of RFID tags and can enrich the process of food management. The examples given above are just the tip of the iceberg. 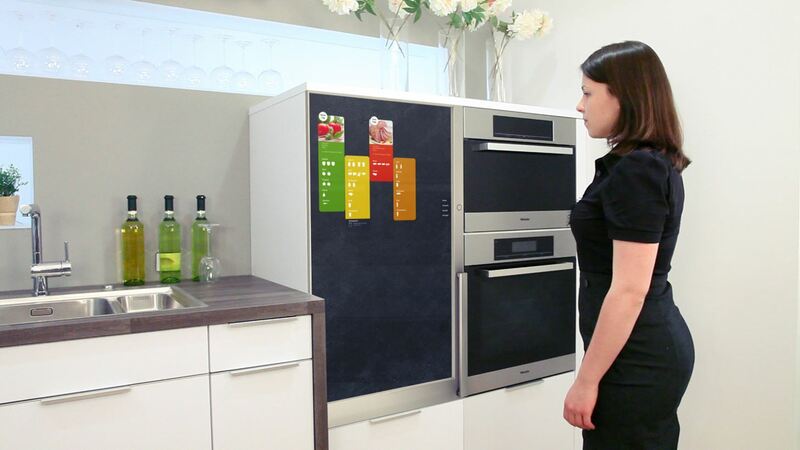 An intelligent oven for example, could receive a message from the refrigerator. The message could contain the chosen dish for supper and the oven could set itself to the proper settings and help during the cooking process. The design of the user interface of our project is quite uncommon. That's because the user shouldn't feel like he is using an application at any time. Essential information is displayed as soon as he takes a look at the refrigerator. Therefore he doesn't have to interact with the system in the first place. If he chooses to do so, he can intuitively use his finger. Further information - diet plans, shopping lists or cooking recipes - can be retrieved with a single fingertip. The key design element is a dynamic list. It basically provides a quantitative overview of goods available in your household. The list can modify itself and provide additional information like for example the date of expire - shown in a bar graph. Large-format views show pictures of goods or dishes and function as an appetizer or to support healthy eating. 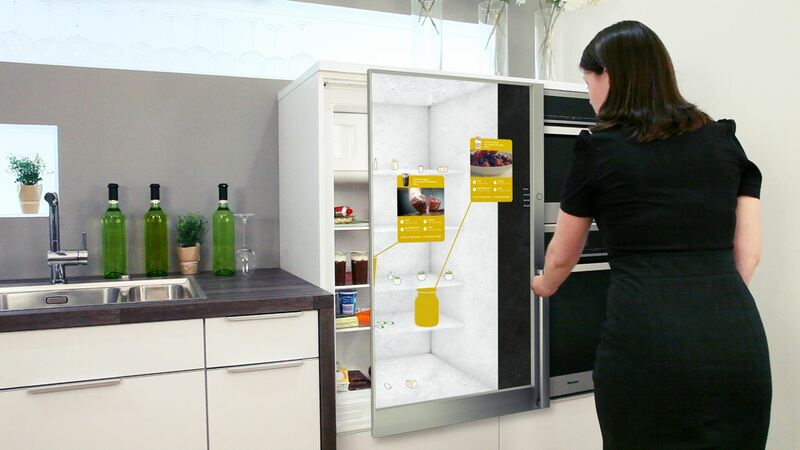 A 3D view enables the user to take a look into the refrigerator - even if the door is closed. Thus you can localize products without opening the door. As a result, the door is closed most of the time which keeps the temperature low and saves energy. If the door is kept open for too long, a blue light indicates the user to close the door. In order to proof the concept, we built a prototype which is able to display and to process an operation process. Thus we were able to test a part of our concept on a functional refrigerator which made it possible to detect problems within the concept and to improve it afterwards.